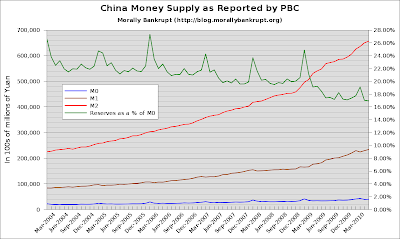 The Chinese money-supply data for April has been released. While it shows no further increases in the rate of growth, with YoY growth levels steady from March, it still shows significant expansion. The M1 measure showed a 31% YoY growth, a decline from its record-setting 39% in January, but still quite elevated; M2 growth dropped by 1% MoM to 21%, down 9% from its October record of 30%; M0 continued its increase at 16%; and the Money Multiplier increased 0.03 points to 5.9, an all-time high. The increasing MM is indicative of a continuing increase in lending, even as reserve-requirements increase (more below) and corroborates the "property bubble" story, but can not be considered evidence. 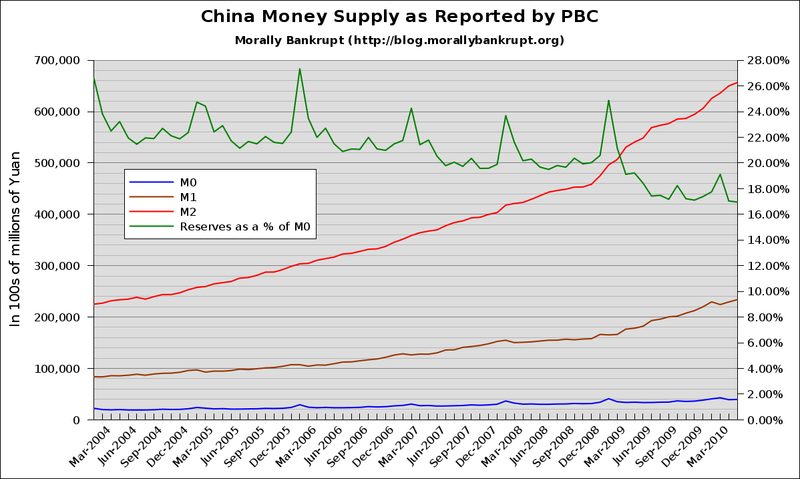 What is clear from this is that there is still increasing demand for loans. While the numbers are nothing radically different from what we've seen in the last couple of months, the M0 growth is quite elevated and indicative of loose monetary policy, a little surprising considering the tightening--via reserve requirement increases--in January and February. It'll be interesting to see the May and June numbers considering the additional increase in reserve-requirements in May, as the numbers do indicate a heated economy.